Brussels sprouts and potatoes are both ubiquitous ingredients found on holiday dinner tables, and I love that this scrumptious dish combines the two of them - and all in one pan! 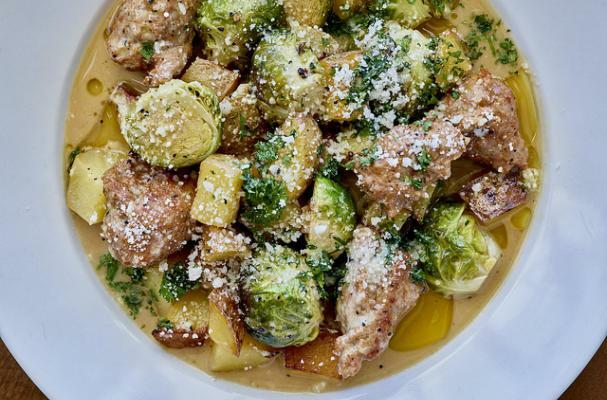 Tender, buttery Yukon Gold potatoes are first browned in a skillet, then simmered in chicken stock with sausage, garlic, and Brussels sprouts. Once the stock has reduced, the dish is finished with a spritz of fresh lemon juice, chopped parsley, and nutty Pecorino cheese. It's the perfect side dish any night of the week, and is excellent the next morning topped with a fried egg! In a large shallow pan over medium heat, drizzle olive oil and add diced potatoes. Cook potatoes until tender, about 5 to 10 minutes. They should start to soften and brown on the bottom. Do not let them burn. Add 1 cup of the chicken stock and scrape the potatoes off the bottom of the pan as they simmer. Break sausage into bite-size pieces and add to pan with Brussels sprouts and smashed garlic cloves. Place lid on pan and let cook for 10 minutes or until sausage is cooked and Brussels are slightly softened. Turn pan on high heat and add the rest of your stock. Reduce stock halfway. Add pecorino while stirring. Check the potatoes to make sure they are cooked through. If so, add parsley and lemon. Note: Chef James loves to add a sunny side up fried egg to this dish, especially if there are leftovers in the morning. Hot sauce doesn’t hurt either. Hawthorn Suites by Wyndham has teamed up with renowned chefs Hari Nayak and James Rigato to create custom recipes for guests to make in their Hawthorn Suites kitchenettes. The Homemade@Hawthorn collection of easy recipes can be found here. All 14 recipes are designed for the home chef, using simple and fresh ingredients, and range from healthy to hearty. They take under 55 minutes to make with the majority using under 10 ingredients.